Morocco's King Mohammed VI has pardoned a total of 188 people linked to the "Hirak" protest movement on the occasion of Islam's Eid al-Adha religious feast, the National Council on Human Rights said Tuesday. The council initially reported that royal pardons had been granted to 11 activists serving sentences of two to three years in prison for their part in the Al-Hirak al-Shaabi, or "Popular Movement" whose protests rocked the northern Rif region in 2016-2017. The other pardons concern people sentenced in connection with the demonstrations in the disadvantaged region, according to the Moroccan press. It was not immediately possible to get confirmation from the justice ministry, which published the list of people granted royal pardons. The social unrest linked to Hirak began in October 2016 after the death of a fisherman and spiralled into a wave of protests demanding more development in the neglected Rif region and railing against corruption and unemployment. The pardoned Hirak detainees were immediately released and the rights council has begun coordinating with local authorities in various cities to prepare for their return home, according to a council official. A Casablanca court on June 26 sentenced 53 Hirak members to prison terms ranging from one year to 20 years. The severity of the punishment sparked anger and protests, along with appeals for royal clemency. 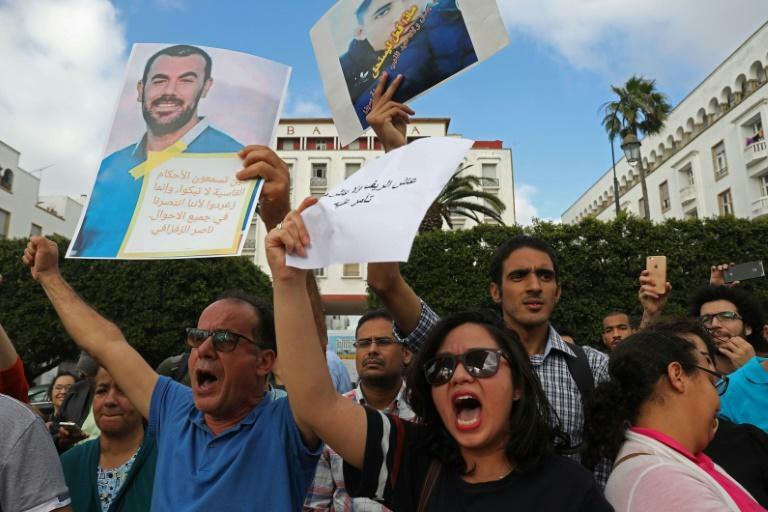 The total number of convictions tied to Hirak are not known, but the protests have led to more than 400 arrests, the rights council says. The movement's leader Nasser Zafzafi, sentenced with three companions to 20 years in prison for threatening the security of the state, was not among those on the pardon list. Nor was journalist Hamid el Mahdaoui, sentenced to three years for covering the events. The defendants in the Casablanca trial have appealed and the hearing is scheduled for October. Amnesty International has called for the verdicts and sentences to be overturned "due to the unfair nature of their trials". Authorities have said the trials were fair. The 2016 protests began when fisherman Mouhcine Fikri was crushed to death in a rubbish truck, while he was apparently trying to retrieve swordfish seized by authorities as it was caught out of season. Subsequent unrest in the Rif region, where the marginalised Berber ethnic group is the majority, focused on social issues as demonstrators demanded jobs and development. Morocco is marked by glaring social and territorial inequalities, against a backdrop of high unemployment among young people. In 2017, the north African kingdom was ranked 123 out of 188 countries on the UN's Human Development Index. Royal pardons are traditionally handed down at major holidays. Mohamed VI also pardoned 522 people for Youth Day on Tuesday which is also the birthday of the monarch, who turned 55. On Monday, the anniversary of "the revolution of the king and the people", he had also granted 428 pardons, including for 22 Salafists convicted of extremism or terrorism but who had volunteered for a "Reconciliation" reintegration programme.